Aromatic hydrocarbons emitted from gasoline-powered vehicles contribute to the formation of secondary organic aerosol (SOA), which increases the atmospheric mass concentration of fine particles (PM2.5). Here we estimate the public health burden associated with exposures to the subset of PM2.5 that originates from vehicle emissions of aromatics under business as usual conditions. The PM2.5 contribution from gasoline aromatics is estimated using the Community Multiscale Air Quality (CMAQ) modeling system and the results are compared to ambient measurements from the literature. Marginal PM2.5 annualized concentration changes are used to calculate premature mortalities using concentration-response functions, with a value of mortality reduction approach used to monetize the social cost of mortality impacts. Morbidity impacts are qualitatively discussed. Modeled aromatic SOA concentrations from CMAQ fall short of ambient measurements by approximately a factor of two nationwide, with strong regional differences. After accounting for this model bias, the estimated public health impacts from exposure to PM2.5 originating from aromatic hydrocarbons in gasoline lead to a central estimate of approximately 3800 predicted premature mortalities nationwide, with estimates ranging from 1800 to over 4700 depending on the specific concentration-response function used. These impacts are associated with total social costs of $28.2B, and range from $13.6B to $34.9B in 2006$. These preliminary quantitative estimates indicate particulates from vehicular emissions of aromatic hydrocarbons demonstrate a nontrivial public health burden. The results provide a baseline from which to evaluate potential public health impacts of changes in gasoline composition. Field studies suggest 10% - 60% of fine particulate matter (PM2.5) is comprised of organic compounds [1–3]. This material may be directly emitted to the atmosphere (primary) or formed from the gas-phase oxidation of hydrocarbon molecules and subsequent absorption into the condensed phase (secondary). The latter portion, referred to as secondary organic aerosol (SOA), is a major contributor to the PM2.5 burden in both urban and rural atmospheres [4–8], which contributes to a range of adverse health effects [9–12], visibility reduction [13, 14], and global climate change [15–17]. In the atmosphere, SOA can originate from both anthropogenic (e.g., solvent use, mobile sources) and biogenic (e.g., forests) sources. Of the anthropogenic precursors, conventional wisdom is that aromatic hydrocarbons are among the most efficient at forming SOA [18, 19]. Table 1 lists several empirical studies that estimated the contribution of SOA precursors to observed PM2.5 concentrations. These studies show that aromatics typically contribute between 0.1 to 0.45 μg/m3 to observed PM2.5 concentrations [20–23]. A series of sunlight-irradiated, smog-chamber experiments conducted in the 1980's suggested that the PM2.5 formation potential of whole gasoline vapor can be accounted for solely in terms of the aromatic fraction of the fuel . More recent chamber studies show that SOA yields measured under NOx-limited conditions greatly exceed formation under NOx-rich conditions, and that SOA yields under NOx-rich conditions are even greater than were observed previously . Evidence is growing that aromatics in gasoline exhaust are among the most efficient secondary organic matter precursors [19, 25]. While the relative abundance of primary and secondary organic matter is the subject of ongoing debate , air quality models are continually updated to keep up with the latest scientific knowledge [27, 28]. In the United States, gasoline-powered vehicles are the largest source of aromatic hydrocarbons to the atmosphere . Most gasoline formulations consist of approximately 20% aromatic hydrocarbons , which are used in place of lead to boost octane. Therefore, it has been suggested that removal of aromatics could reduce SOA concentrations and yield a substantial public health benefit . The issue is complicated by the fact that any change to fuel composition will affect vehicular emissions of various pollutants (e.g., hydrocarbons, carbon monoxide, oxides of nitrogen [NOx], primary PM2.5) which, in turn, will react in the atmosphere to produce a different mix of pollutants that may have adverse effects (e.g., ). However, a number of studies have noted that gas-phase vehicle emissions lead to a substantial fraction of observed SOA . For example, a source apportionment study of SOA formation during a severe photochemical smog event in Los Angeles found that gasoline engines represented the single-largest anthropogenic source of SOA . The purpose of this study is to estimate the public health impacts and social costs associated with exposure to SOA from vehicular emissions of aromatic hydrocarbons. This analysis provides a baseline case to explore the magnitude of the issue and against which to evaluate the cost and impacts of potential substitutes for aromatics. The next section describes the methods for the analysis, followed by results and a concluding discussion. Predicted secondary PM2.5 concentrations attributable to single-ringed aromatic hydrocarbons are estimated for a baseline year (2006) using the Community Multiscale Air Quality model version 5.0 (CMAQv5.0). Given that air quality models are known to underestimate anthropogenic SOA formation [19, 26, 35], our results are compared to available data to estimate scaling factors for adjusting the model results. Adjusted PM2.5 concentrations are then used in the US EPA Benefits and Mapping Program v4.0 (BenMAP) model to estimate morbidity health and mortality outcomes associated with exposure to these concentrations across the lower 48 states . The CMAQ model is among the most widely used air quality models, with 3000+ registered users in 100 different countries (http://www.cmaq-model.org). Federal and State regulatory agencies use CMAQ for policy analyses and for routine air quality forecasting . The model provides a means for quantitatively evaluating the impact of air quality management policies prior to implementation. This analysis relied on CMAQv5.0 with the Carbon Bond 2005 (CB05) chemical mechanism, which includes a fairly comprehensive list of precursors that lead to SOA formation via both gas- and aqueous-phase oxidation processes, as well as particle-phase reactions . Air quality model simulations based on CMAQv5.0 are used to estimate the total concentration of SOA from all single-ring aromatic compounds (e.g., benzene, toluene, xylenes) in uniform 12km grid cells across the lower 48 states for a baseline year (2006). Although CMAQv5.0 contains updated algorithms and processes for predicting SOA formation, evidence suggests that the model may still underestimate secondary PM2.5 concentrations [27, 28, 38], particularly during the summer . Experiments conducted at Carnegie Mellon University to study SOA formation from the photooxidation of toluene suggest significantly larger SOA production than parameterizations employed in current air-quality models . Using an organic tracer-based source apportionment approach, independently conducted research over the last five years provides increasing evidence that aromatic hydrocarbons in gasoline contribute, depending on the specific region, approximately 0.1 to 0.45 μg/m3 of PM [20–23]. SPECIATE, a US EPA database, includes a large repository of volatile organic compound (VOC) speciation profiles of air pollution emission sources . We use these source profiles in conjunction with the National Emissions Inventory (from the year 2005) for VOCs to estimate the nationwide proportion of aromatic VOCs attributable to emissions from gasoline vehicles. We rank order all sources of aromatic VOCs to quantify the contribution to total emissions specifically from gasoline-based sources. The BenMAP model was used to estimate resulting health impacts associated with exposures to the change in PM2.5 concentrations attributable to aromatic hydrocarbons from gasoline vehicles modeled by the process described above. The BenMAP model is widely used by regulatory agencies to quantify and monetize potential health impacts associated with changes in air quality, and contains concentration-response functions for various pollutants, including PM2.5, census data and population projections, and baseline mortality and morbidity rates for the lower 48 United States. Concentration response functions incorporated in BenMAP are based on published studies incorporating different assumptions regarding potential thresholds and observed slopes between concentrations and responses. Four studies are included in this analysis [12, 41–43]. Two major cohort studies are generally thought to provide estimates regarded as most robust and applicable to the general population, with the Harvard Six Cities Study publications reporting central estimates of an approximate 1.2-1.6% increase in all-cause mortality per μg/m3 increase in annual average PM2.5 and the American Cancer Society studies reporting estimates of approximately 0.4-0.6% , with higher estimates when exposure characterization was more spatially refined . Within the expert elicitation study  (Industrial Economics, Inc. 2006) the median concentration-response function across experts was approximately 1%, midway between these cohort estimates, with a median 5th percentile of 0.3% and a median 95th percentile of 2.0%. The EPA Science Advisory Board external Advisory Committee on Clean Air Act Compliance Analysis recommended developing a distribution with the Pope and Laden studies at the 25th and 75th percentiles, respectively, leading to a mean of the new distribution close to the mean of the central estimates of both Pope and Laden. This generally will be consistent with the distribution identified in the expert elicitation, as recommended by EPA’s Science Advisory Board . BenMAP applies these functions to the baseline mortality rate and the number of people potentially exposed by census tract. BenMAP provides distributions of premature mortality estimates based on the uncertainty in the concentration-response functions. That is, the 5th and 95th percentiles in the results are based on the distributions for concentration-response functions only. Monetized estimates of premature mortality are based on regulatory estimates of the value of mortality risk as defined by the U.S. EPA . This estimate is based on research in which people are asked how much they would pay for consumer products (such as water filters) that reduce risk or alternatively, that examine how much more employers have to pay employees (adjusting for age, education, experience, etc.) to compensate for taking an increased risk of accidental death. Hence this estimate is not a price on a life, but a price of risk reduction. For convenience it is converted into what was referred to as a value of a statistical life and is now referred to as the value of mortality risk. The implication is if people are willing to pay $X for a reduction in risk of 1 in 10,000, than reducing risk in enough people to produce, on average, one fewer death would be worth 10,000 X dollars. The U.S. EPA recommends a value of $7.4M in 2006 dollars  based on over 30 labor market and contingent valuation studies. Additional file 1: Table S1 compiles measurement-based estimates of aromatic SOA collected at twelve locations between 2004 and 2010. Concentrations reach as high as 0.41 μgC/m3 during the summer in Cincinnati, with a median value of 0.14 μgC/m3 across all 77 samples. In contrast, the CMAQv5.0 model results from the corresponding 12 km grid cells and averaged over the appropriate month in 2006 show a maximum value of 0.13 and a median of 0.052 μgC/m3 (see Additional file 1: Table S1). This systematic bias in the model results warrants some adjustment of the CMAQv5.0 output before it is used in the BenMAP calculations. The mixed model obtained by regressing observations against the CMAQv5.0 results are shown in Table 2. The slopes do differ by region, with the highest slopes observed in the East and Midwest. Aggregated up to the national level, unadjusted CMAQ results predict a nationwide average concentration of 0.045 μg/m3, which increases to 0.17 following the adjustment, a factor of approximately 3.8. Model based on Equation 1. Linear mixed model fit by REML. Formula: SOA ~ CMAQv5.0 + (CMAQv5.0 | region). Source-specific speciation of total VOC in the 2005 National Emissions Inventory reveals that the U.S. emissions of single-ring aromatic hydrocarbons are 3.6 million tons per year, of which 69% are from gasoline-powered vehicles  as shown in Table 3. A source-by-source breakdown of all aromatic hydrocarbon emissions is provided in Additional file 2: Table S2. To subtract the contribution of other emission sources (e.g., solvent usage, diesel exhaust) from our calculations, the adjusted aromatic SOA concentrations from CMAQv5.0 are multiplied by 0.69. This information was obtained by combining VOC emissions from the 2005 National Emissions Inventory with speciation profiles from the SPECIATE database. See Additional file 2: Table S2. Spatial patterns of aromatic emissions are similar across sources. After gasoline, the next highest source of aromatics is solvent usage, and Reff et al. show that the spatial pattern of solvent usage is similar to gasoline, that is, occurs predominantly in urban areas. In addition, most major refineries are also in close proximity to urban areas. Figure 1 shows the final nationwide distribution of annual average PM2.5 concentrations attributable to aromatic hydrocarbons emitted from gasoline vehicles, after applying all the adjustments to the CMAQv5.0 output described above. The nationwide average concentration based on the average predicted value for each state is approximately 0.17 μg/m3 (standard deviation = 0.06 μg/m3; minimum = 0.03 μg/m3, maximum = 0.3 μg/m3) and ranges from 0.013 to greater than 0.6 μg/m3 at the county level. On a statewide basis, Table 4 shows the rank ordered concentrations by state, with Connecticut, Rhode Island, Ohio, New York, New Jersey and Indiana at or exceeding 0.2 μg/m3 statewide. Annual average PM 2.5 concentrations attributed to aromatic emissions from gasoline vehicles, after accounting for region-specific CMAQ model biases and subtracting aromatic contributions from other VOC sources. Figure 2 presents a nationwide map of predicted premature mortalities attributable to aromatic hydrocarbons in gasoline associated with the expert elicitation concentration-response function. Table 5 and Figure 3 provide a summary of predicted premature mortality and monetized estimates of social cost based on all four different concentration-response functions. Predicted premature mortalities range from nearly 1,850 to more than 4,700 cases, depending on which concentration-response function is used, which correspond with approximately $13.6B to $34.9B in total social costs. The 5th and 95th percentiles from each study are included in the parentheses, and represent the effect of uncertainty in the concentration-response functions only (e.g., there are many potential sources of uncertainty, but only those associated with the concentration-response functions are captured in BenMap). Our recommended best estimate is approximately 3,800 premature mortalities based on the mean of the expert elicitation concentration-response function. Using the central estimates from the Krewski  and Laden  studies, respectively, results in a confidence interval of 1,800 to 4,700 for a central estimate. 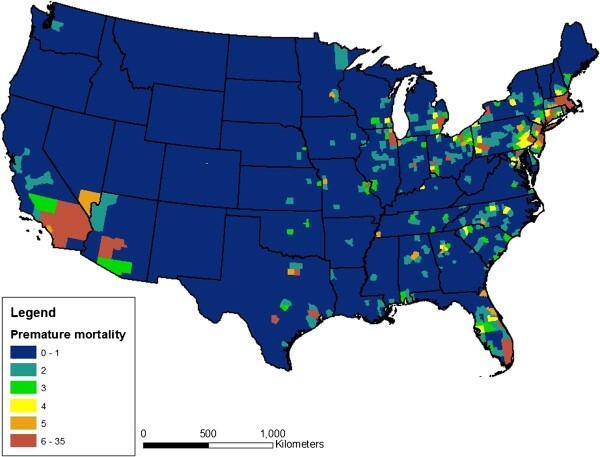 Estimated cases of premature mortality per year in each U.S. county based on the consensus expert elicitation concentration-response function. Value of mortality reduction = $7.4M per case in 2006$. Beta = percentage change in mortality for a 1 μg/m3 change in PM2.5 concentration. (a) = uniform application of the 0.69 scaling factor to account for sources of aromatic emissions. (b) = rural areas adjusted by 0.69; 100% of aromatic emissions in urban areas assumed to originate from gasoline. Incidence and total social cost associated with exposure to aromatic SOA from gasoline emissions. The results in columns 3–4 (a) in Table 5 have been adjusted by 0.69 to account for the fraction of aromatic emissions attributable to gasoline sources based on the 2005 National Emissions Inventory. However, it is possible that the fraction of aromatic emissions from gasoline could be higher in urban areas (although, as noted previously, Reff et al. have shown that spatial patterns of emissions from other sources of aromatics such as solvent usage are similar to gasoline). To explore the potential impacts of this assumption, we adjust only those counties designated as rural counties  by 0.69 and assume that 100% of emissions in urban areas are derived from gasoline sources. The results are shown in the final two columns of Table 5 and in Figure 3. Predicted premature mortality increases to a little over 5,000, and based on the concentration-response function used, ranges from 2,400 to over 6,300. Table 6 provides predicted premature mortalities and associated social costs for each of the four concentration-response functions. Figure 4 provides the results for each state, sorted from highest to lowest predicted impacts, using MetaDataViewer available from the National Toxicology Program  for the best estimate represented by the expert elicitation slope (the remaining results are proportional based on the results presented in Table 6; results not shown graphically). New York, with 0.21 μg/m3 of its PM2.5 attributable to aromatic SOA, shows the highest predicted impacts based on the number of exposed individuals. Ohio and Pennsylvania follow, with approximately 260 predicted premature mortalities each (based on the midpoint of the combined expert elicitation concentration-response function). The two states with the highest populations, Texas and California, are ranked eighth and tenth, respectively, for premature mortalities at approximately 170 and 130 expected cases, respectively. 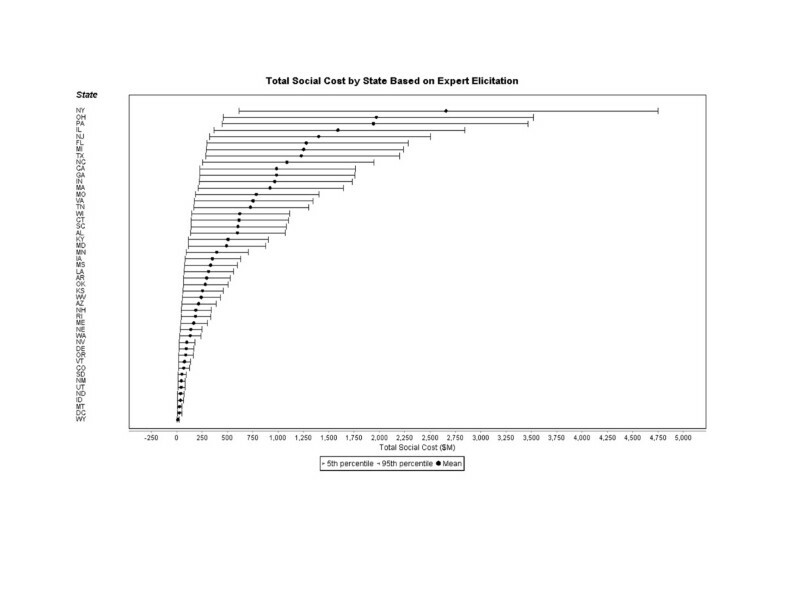 Total social costs by state based on expert elicitation concentration-response function. Our best estimate of potential impacts is based on the expert elicitation concentration-response function recently endorsed by a US EPA Science Advisory Board Panel together with the regression-based adjustment factors to the CMAQv5.0 predictions, resulting in 3,800 predicted premature mortalities. This compares to a recent nationwide estimate of approximately 130,000 overall premature mortalities (for 2005) associated with all PM2.5 exposures recently discussed by Fann et al. and based on the Krewski et al. concentration-response function. The results presented in Fann et al. were based on CMAQv4.7 together with additional monitoring data to estimate premature mortalities attributable to exposure to PM2.5 concentrations from all sources. The incremental contribution from exposure to aromatic SOA from gasoline using the adjusted results presented here and the Krewski concentration-response function represents approximately 1.4% of the total 130,000 estimated by Fann et al.. While this may seem a small fraction of total PM-attributed mortality, these results are comparable to many public health measures, and with the Cross State Air Pollution Rule implementation in the next five years, are likely to constitute a higher portion of PM-related deaths in the future. Under this rule, if SO2 emissions decrease by an expected 50%, sulfate will become a smaller fraction of PM2.5; therefore, other sources will become more important, particularly since SOA from aromatic hydrocarbon precursors are not expected to decrease and could represent an increasingly larger fraction of exposures. In addition to premature mortality, which dominates monetized estimates of total social cost, exposures to SOA from aromatics in gasoline are associated with other health outcomes, including exacerbation of asthma, upper respiratory symptoms, lost work days, and hospital emergency room visits. To put our monetized social cost (central estimate of $28.2B) in context with other analyses, a recent study evaluated the public health impacts associated with exposure to direct emissions of PM2.5 attributable to congested traffic conditions  and estimated a total social cost of $31B (in 2007$). US EPA’s Heavy-Duty Highway Diesel Final Rule  estimates an 8,300 reduction in premature mortalities, a little more than twice the number of premature mortalities from this analysis. While we have provided a best estimate of the public health impact of gasoline-driven aromatic SOA in PM2.5 based on current information, the exact sources of SOA remain a topic of ongoing debate. For example, a recent study in Los Angeles  found that gasoline emissions dominated SOA formation, accounting for nearly 90% of total aerosol formation, and the ratio of SOA to primary organic aerosol was approximately a factor of three. However, another recent study from California  found diesel exhaust to be responsible for 65% to 90% of vehicular-derived SOA and was 7 times more efficient at forming aerosol than gasoline exhaust. Overall, data suggest that across most areas in the U.S., SOA represents some 30%-40% of organic carbon concentrations [5, 54–57]. Anthropogenic emissions have been shown to enhance biogenic SOA formation [58–60]. For example, SOA formation in the southeastern United States was investigated through a comparison with urban plumes in the northeast to identify biogenic versus anthropogenic precursors. The authors found that 70-80% of summertime carbon was of anthropogenic origin, and that anthropogenic precursors enhanced SOA formation from biogenic VOCs . Photo-oxidation of aromatics has been shown to significantly contribute to anthropogenic SOA formation, but many factors contribute to variability in SOA formation that are not well understood, including spatial and chemical variability in emissions, the amount of time needed for PM formation, and varying ambient conditions at different scales [61, 62]. CMAQ model performance of SOA formation has improved substantially with each version of the model, but likely doesn’t capture every process, given that SOA formation depends on varying atmospheric physical and chemical conditions which are simulated at coarser scales in the CMAQ model relative to the (unknown) scales at which they occur in the environment. For example, Snyder et al. found markers for mobile and other sources differed by as much as 60% within the neighborhood scale and by greater than 200% within the urban scale. The error in tracer-based estimates of aromatic SOA formation is approximately ±33% ; therefore, measurements are somewhat better understood than the specific processes and conditions leading to those observations. A strength of this analysis is the combination of modeling corroborated by empirical studies to provide a baseline estimate of predicted premature mortality associated with secondary organic particulate formation. Although aromatic SOA is a small component of PM2.5, our results show that exposure to secondary organic aerosol originating from aromatics in gasoline constitutes a non-trivial public health impact. Replacements for those aromatics are not risk-free themselves, and must be evaluated in a life-cycle context. As alternatives to aromatics in gasoline are contemplated, it will be important to consider the potential public health impacts associated with different transportation, fuel, and infrastructure design options (see, for example, Cook et al., who developed a life-cycle assessment approach to evaluate the impacts of increased use of ethanol under several scenarios). Vehicle emissions of aromatic hydrocarbons originating in gasoline contribute to secondary formation of organic particulate matter. While many uncertainties exist in the exact mechanisms involved in secondary organic aerosol formation and the scales over which these mechanisms occur, our preliminary quantitative analysis provides a baseline estimate of premature mortality in the lower 48 states. Predicted premature mortalities range from 1800 to over 4700, demonstrating a non-trivial public health burden. Katherine von Stackelberg, Jonathan Buonocore contributed equally to this work. Thanks go to Steven Melly for preparing Figures 1 and 2, and to Tad Kleindienst for providing observational data from the California sites. The United States Environmental Protection Agency through its Office of Research and Development collaborated in the research described here. It has been subjected to Agency review and approved for publication. The authors declare no competing financial interests. Funding for KvS, JB, and JS was provided by the restricted gift from Boyden Gray & Associates, PLLC to the Harvard Center for Risk Analysis. PVB participated as part of employment with the US EPA. KvS wrote the manuscript with oversight from JS, JB conducted the BenMAP modeling using CMAQ results provided by PVB. All authors edited, read and approved the final manuscript.